NeoBulletin Trash font is decorative font which is designed by Intellecta Design. This font is labeled as Typewriter font. 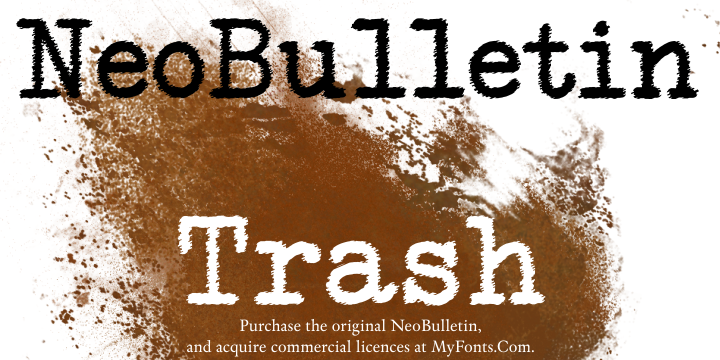 NeoBulletin Trash font family has 1 variant. NeoBulletin Trash, by Intellecta Design NeoBulletin Trash is a "limited" free version, with a different set layout, based in the original NeoBulletin. To purchase the original and complete NeoBulletin with over 600 gliphs and ready to use in many languages (see the font history below) and commercial licences, please, visit: http://new.myfonts.com/fonts/intellecta/neo-bulletin/ Visit my commercial library : http://new.myfonts.com/foundry/Intellecta_Design/ Donations are appreciated! ================================================================================== THE ORIGINAL FONT, AVAILABE AT MY FONTS HISTORY: NeoBulletin is a complete typewriter font, with complete sets in Latin, Cyrillic and Greek characters. In the same open type font you get also Central European, Vietnamese, Baltic, Turkish complete sets with all diacritic signs and punctuation marks plus extra characters belonging this ranges. The complete open type font has over 600 glyphs. You have total access to these resources using software like InDesign, Illustrator, QuarkXpress and others. NeoBulletin Trash font is one of NeoBulletin Trash font variant which has Regular style. This font come in ttf format and support 227 glyphs. Based on font metric, NeoBulletin Trash Regular has usweight 400, width 5, and italic angle 0. This font is labeled as .